Union Minister of State (Independent Charge) for Information & Broadcasting and Youth Affairs & Sports, Col.Rajyavardhan Rathore (Retd.) today released the Administrative Handbook of Ministry of I&B. The handbook is a blend of a telephone directory and a diary and displays contact details of all officers of the Ministry and Media Units, including, inter-alia, Press Information Bureau, Bureau of Outreach and Communication, Registrar of Newspapers for India, DD News, NSD - All India Radio, Publications Division, Electronic Media and Monitoring Centre, New Media Wing, Autonomous Organizations, IIS Officers at DPR Defence, IIS Officers posted in other organizations, IIS Officers on Deputation and IIS Officers on Probation at IIMC. 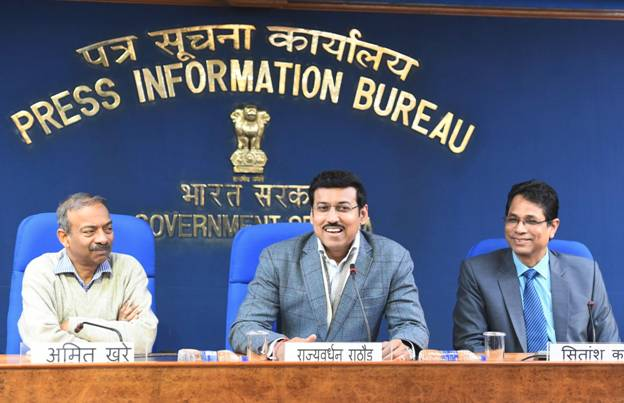 Speaking on the occasion, Col. Rathore appreciated the work of the officials under Ministry of I&B for displaying great initiative in taking the schemes of the Government of India to the masses in new and innovative ways. He complimented the Officials for breaking through silos and working in coordination across departments. Invigorating the Officials to go above and beyond their call of duty, he called everyone for following mission orientation in discharge of duties. Shri Amit Khare, Secretary, Ministry of I&B said that the Officials under Ministry of I&B have displayed tremendous team spirit this year, be it in organization of IFFI, release of selected speeches of Hon’ble President of India or in organization of Parakram Parv. He also stressed on the importance of such teamwork for ensuring success. Speaking on the occasion, Shri Vikram Sahay, Joint Secretary, Ministry of I&B said that the handbook will bring all Officials under Ministry of I&B closer and strengthen the person-to-person connect amongst more than 750 Officials posted all across the length and breadth of India. Shri Sitanshu Kar. Principal Director General, PIB, Shri Shashi Shekhar Vempati, CEO, Prasar Bharati, Ms. Ira Joshi, Director General, NSD-AIR, Shri Mayank Agrawal, Director General, DD News and other senior Officials of Ministry of I&B and Media Units under the Ministry were also present on the occasion.